One thing’s for sure, last night’s Game 1 of the 2018 NBA Finals was the most J.R. Smith game of J.R. Smith’s career. Ask him to be anything other than J.R. Smith and he can’t do it! With the game tied at 107, Smith was in perfect position to grab George Hill’s rebound, then inexplicably took the ball out to the top of the key as the final seconds ticked away. 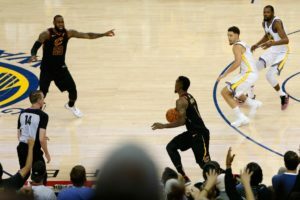 But upon closer inspection, can J.R. Smith truly be blamed? First, let’s check the tape. Now this would be confusing to anyone, even to Filipino day traders, who, arguably, would be more familiar with the Philippine Stock Exchange than J.R. Smith. Undoubtedly, a kiss between comedy legends Jonah HIll and Russel Brand would confuse anyone, not just marijuana advocate J.R. Smith. So, while many will take the next few days to excoriate Smith’s decision-making, we say: check the evidence. 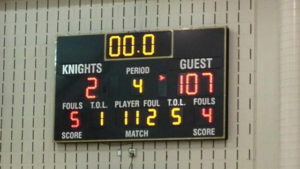 As for the Oracle Arena scoreboard officials, we’re still waiting for an apology. Previous Post:The Sports Dump list of the “Best” Available undrafted NFL free agents.